Strawberries are now in season so i thought to post something in which we could use strawberries. Yesterday we had strawberry smoothie in evening and it was so yummy and now try this cake with your evening tea.But if you want strawberry to taste good, you have to choose the deep red color because red skin one will gives you the highest nutrient density. Talking about vitamins that Strawberry contains, there are vitamin C, K, B5, and vitamin B6. Studied show that the consumption of Strawberry can reduces the prostate Cancer. In addition to this, it ranks in number sixth of most anti-oxidant rich fruit. Another test in laboratory added that Strawberry may reduce the LDL​​​​​​​​​(low density of lipoprotein), which is a contributor of heart disease, stroke, and atherosclerosis. Crush the biscuits finely in a blender. Add butter and 3 tbsp sugar in it. Press it firmly at the base of baking pan. Bake this crust for 10 minutes and then set it aside. Beat 1/2 cup sugar, cream cheese, lemon juice and zest with electric beater till its well blended. Add sour cream and eggs one by one. Mix well. Now pour this mixture over biscuit crust. Bake for 50 minutes or until cake is done. Drain strawberries, heat its liquid with little water added. Dissolve corn flour in water and put in strawberry syrup, stir continually till it thickens. Add strawberries in this mixture. Let it cool down. 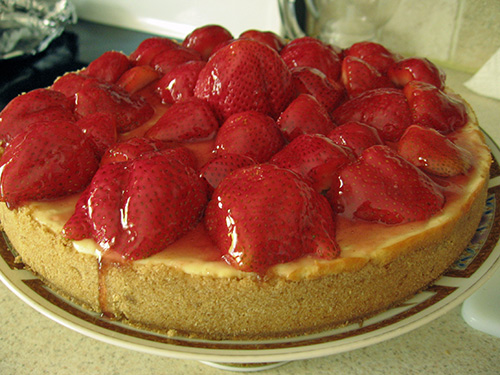 Spread strawberry mixture over the cake and refrigerate it at least 4 hours before serving.